Join us for Yoga on Friday, March 1 at 8:30 am. We’ll meet right after morning meeting at Heal Thyself Spa (across from Eventide) and start conditioning for Run with the Wolves. This PTCA Health & Wellness class is free. Please bring your own mat. 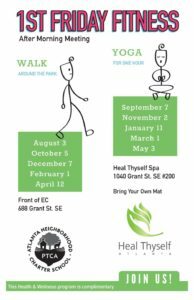 Attendees receive 10% off Heal Thyself Spa services.